If you see police cars in a restaurant parking lot at lunch time, STOP! The local police always know the best places to eat, so if you’re in an unfamiliar town, just look follow the police cruisers. A co-worker and I were in Benton Harbor for a quick assignment. We literally drove there during a snow storm for about fifteen minutes of work, but it’s what we had to do. Not wanting to head back in to the storm right away, C.W. asked if there was a sandwich shop somewhere to grab something to eat. Of course, I always do my research when we leave Kalamazoo. 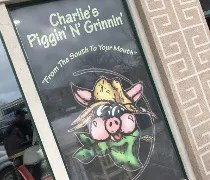 Charlie’s Piggin’ N’ Grinnin’ is about a block north of Main Street in Benton Harbor near the corner of Territorial Road and Water Street. It’s in what looks to be an old mixed use building that had two separate streeet level storefronts and apartments above it. Charlie’s takes up both of those storefronts now. The parking lot next door was home to the Bell Opera House many, many years ago. 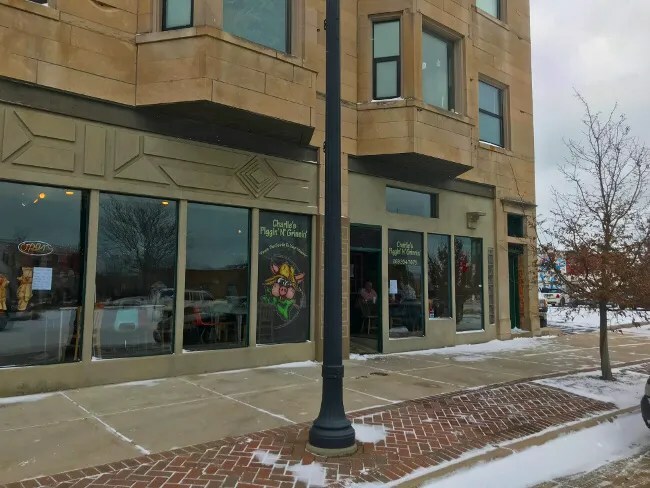 The building appears to be from the turn of the 20th Century and the only remaining building on this block that used to be a vibrant downtown Benton Harbor. Like I mentioned in the intro to this post, follow the police cars. When we pulled in to the parking lot there were two cruisers from Benton Township and one from Benton Harbor Public Safety. We knew we were in for a good meal when we saw that. Inside, Charlie’s Piggin’ N’ Grinnin’ is quite spacious. They setting is a little dark with exposed brick walls in some places, mismatched and dated furniture, and what looks like worn plywood floors. They really take advantage of the natural light the large windows that face Territorial Road. If you sit near the windows, the lighting is nice and bright but the further you get back in to the dining room, the darker it gets. Framed newspaper clippings adorn the wall in the larger dining room which is painted a light blue which reflects some of the light back to the middle of the space which is divided by a brick wall. The order counter is near the back and was being run by three women. One was taking orders while the other two put them together. The menu of BBQ staples hangs above the counter on dry erase boards while the meat and sides sit in warming pans along the back wall. I ordered the Beef Brisket Sandwich which comes with a side. My pick was the Mac & Cheese. I added on a Coke to bring the total to a little under $12. The meal was served on real, colorful plates. Meat is served without sauce, but there is some on the table and more on a stand in the middle of the room with silverware and napkins. 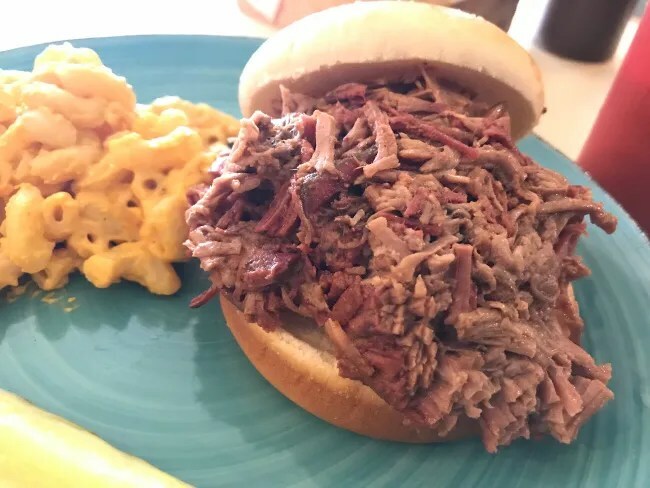 The brisket was piled on pretty high on the simple white bread bun. The beef was chopped instead of sliced. It was super tender and just melted in my mouth. Being chopped, it didn’t have a good bark flavor to it but it was juicy and had a strong beefy flavor. The side of Mac & Cheese was just a big enough portion to compliment the sandwich. It was macaroni pasta in a thick, glowing yellow sauce. 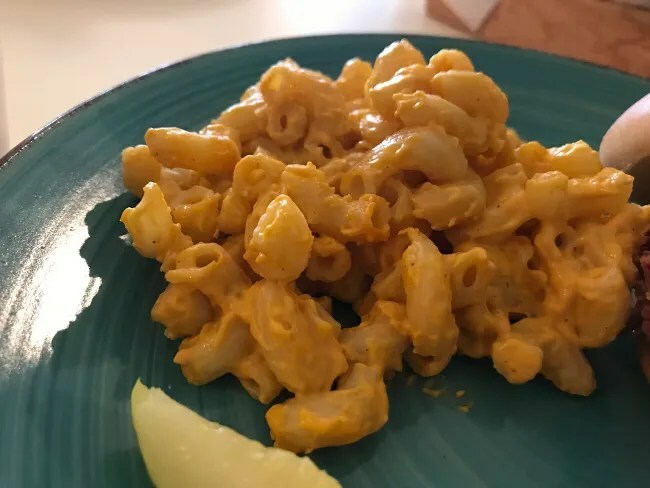 The color was similar to what you’d find in a boxed mac and cheese dinner, but this had a really good, strong cheddar flavor. 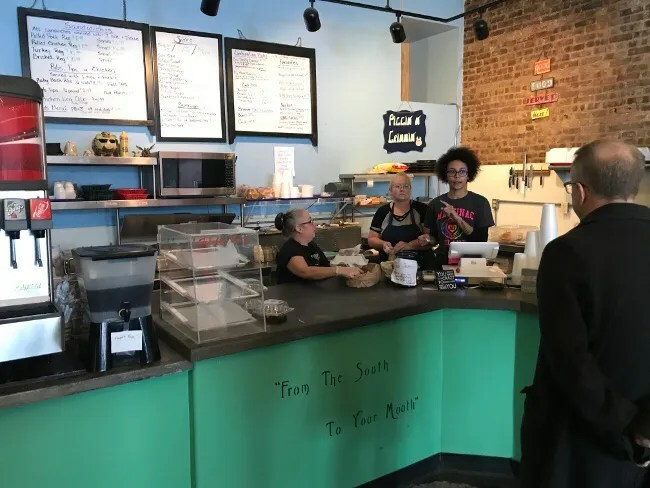 Charlie’s Piggin’ N’ Grinnin’ is another great BBQ spot in the City of Benton Harbor (Lark’s Bar-B-Que is right around the corner). They’ve been in this part of town for quite a while and seem to have created a following. So many people come to St. Joseph in the summer and don’t realize they’re passing this gem on the other side of the river. 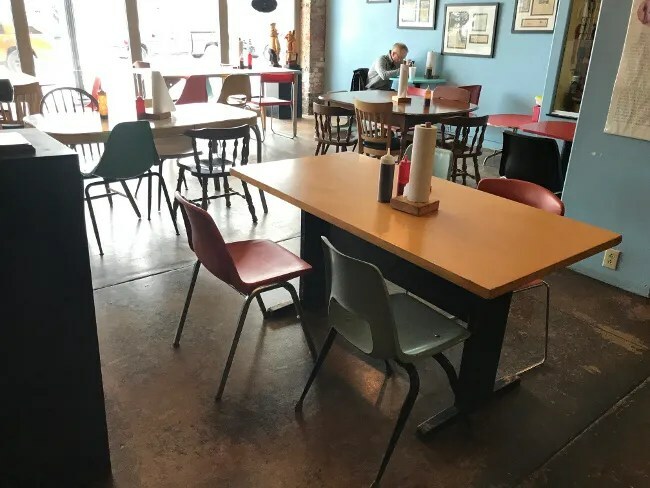 The owner is from Memphis and decided when he couldn’t find any Memphis-style BBQ places in the area, he’d just do it himself. I’d say that worked out pretty well for him.